Who remembers the story of Pandora's box? From Greek mythology, Pandora's box was a container given to Pandora, the first woman on Earth. As woman #1, commanded by Zeus, she wore the finest clothes and had the voice of an angel, along with other gifts wrapped in a package of pure beauty. However, Pandora got dragged into the middle of a Greek god battle royal and as such, received a box with the instructions to not open no matter what. Well - you know you can't do that and think it won't happen. She opened it and all evil escaped and spread across the land. Well, the box I am referring to is the opposite of evil. Here at 2x3 Stadium, I received a box from Shane over at Off The Wall. I caught one of Shane's post in the blogroll and noticed he needed minis. Hey - I got a whole page of them I want to trade! So after a few emails, I shot Shane a large stack of minis for his want lists, and Shane did some damage to my needs. And then some. I don't even know where to start, and with so much amazing goodness to take in, I have to break this over two posts. So I have decided to keep incredible remakable items for tomorrow, and show the super duper stuff today. And we start small. MINIS!!! I missed the whole 2011 GQ, but I really like the set. 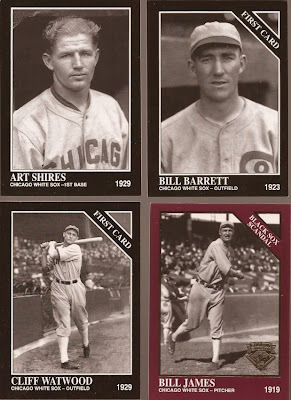 Until someday arrives, I will take those great ChiSox minis, along with the T206 of Dye. Shane took about ten off of my 2010 mini set needs. And the Shakespeare (along with a non-show Apollo) completed a couple 2010 min insert sets. MORE MINIS-ish!!! 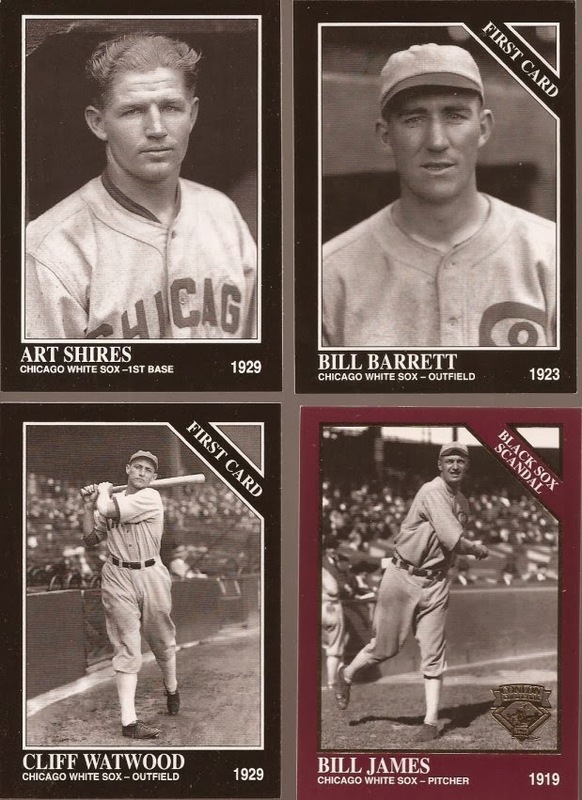 Reprint of a Goudey - yes please. Reprint of a Play Ball - yes please. 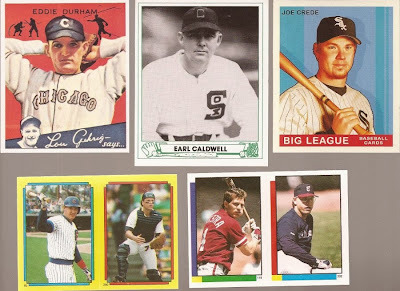 Crede Goudey - yes please. And how about some late 80's Topps mini stickers - yeah....you know. Great group of Big Hurt cards in the box. 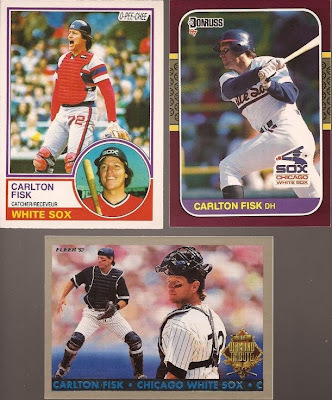 There is the Fleer All Star card that I had featured a week or so ago with other White Sox. The Heading for the Hall - # to 5000. The SI Extra Edition - # to 500! The star, though, is the Hamburger Helper in the middle. That is some pure awesomeness right there. 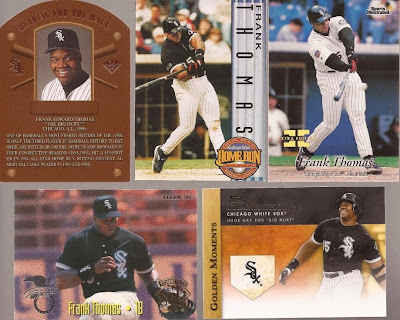 From the Big Hurt to Pudge. The Fleer Tribute on the bottom is a nice simple, but stellar card. Conlon made a nice appearance in the box, too. I have but a few Conlons, so any I get are great additions. Who wants short prints? How pretty is that Yogi? And Troy - red border and SP. Here is the way to do a landscaped card. 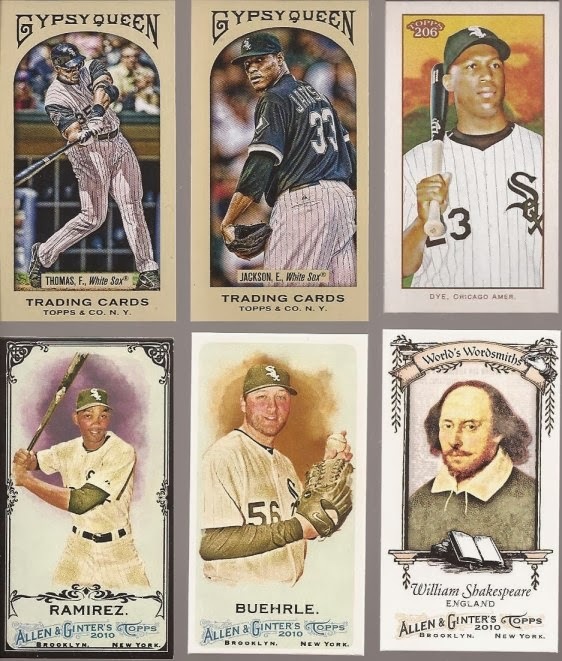 Great framing on the Buehrle. The Baines is a set I have never seen before. I prefer my Raines cards featuring "Rock" instead of "Tim". But baby - that One Dog at the lower right. I love that card. And it reminded me of the great AJ card from this years Topps. Here they are side by side. You can see the changes in the park between the roughly 20 years from one cardboard to the other. New advertisers, Jumbotron change, new outfield wall & batter's eye. Oh, and a little 2005 championship banner. You forget the little changes that are actually big changes. Thanks Topps. We are going to end part one with this T205 booklet. I have been very jealous of other bloggers that get these, and now I can have that green beast rage about something else. Ok - tomorrow, we go old school. Yes - vintage. And I will have at least the same if not more images. I told you the other section is duper le super. 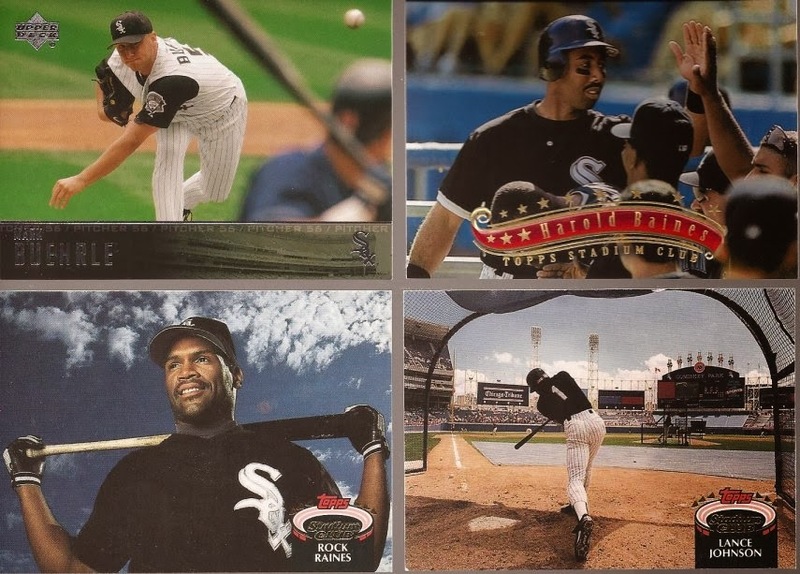 That '92 Stadium Club Lance Johnson is easily one of the most beautiful landscape cards ever printed. I really liked how you started the post with a little Greek Mythology lesson. I was ALMOST disappointed when it ended, but then there were baseball cards! Nice job.